Each year, Valentine’s Day gives us all the opportunity to express our love. This years' Valentine’s Day Regatta at SPYC certainly gave the 161 Gold Fleet sailors a chance to express their love for sailing, because it was pure love for the sport - not wind - that kept them out on Tampa Bay both Saturday and Sunday. Saturday morning presented the fleet with chilly weak winds from the east at 2-4 kts and a 1 kt current dragging even the most experienced sailors across the course to the south. For the first race, there were at least 3 general recalls and 40 BFD’s. 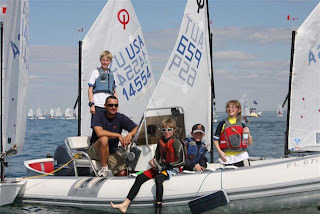 Most of the five LISOT sailors attended the excellent clinic that our coach Marek Valasek ran on Thursday and Friday, so they were prepared for the conditions – especially the inescapable current. After Saturday’s first race, the kids bobbed around the bay for a few hours under AP until the Race Committee pulled the plug at 2 PM. The regatta dinner that night emptied out early as the RC called for a 7:15 AM harbor start the next day. Team LISOT were rigged and ready at 6:45am Sunday morning as per Marek’s request – rigging before dawn will be hard to forget for many of them, including team leader and author of this blog - Peter Bentel. Equally memorable was the spectacular sunrise over the bay as the group towed out to the course. The RC got the marks set and the second race under way just after 8 AM in 3-4 kts of wind from the northeast. The lessons learned about the current on Saturday paid off – only one general recall and no BFD’s. The slowly fading wind shifted slightly to the east as the third race got underway. The current gradually took its toll, as many boats in both groups in this race ran into serious traffic problems at the third mark. The problems followed them to the finish line, which closely resembled a parking lot. The LISOT group sailed well in this one, so were disappointed when the RC abandoned the race after everyone else finally shuffled across the line. Marek kept the team focused for a few slightly frustrating hours of waiting for the wind. The RC tightened the course and eventually started a repeat of race three in 2.5 kts of NNE breeze. Similar to Saturday’s race, there were some general recalls and BFD’s. Ultimately, the entire fleet made it across the finish in super slow motion and towed into shore to pack up and head home. Congratulations to Florian Eenkema Van Dijk and Sean Walsh who, at the last qualifier of the year, made the cut for their first Team Trails. In all, the regatta was a fun yet trying experience for our small band of LISOT sailors, made all the better by Marek’s incisive coaching. We look forward to seeing him up north as the year progresses. Thanks to all the parents for their help and good spirit. And, congratulations to Sean, Florian, Augie, Matt and Antonia for staying focused and upbeat through it all! Happy Valentine’s Day – and keep expressing your love for sailing. As reported by Peter Bentel.